Disclaimer Publications produced by the Mallee Catchment Management Authority may be of assistance to you but the Mallee Catchment Management Authority and its employees do not guarantee that the publication is without flaw of any kind or is wholly appropriate for your particular purpose and therefore disclaims all liability for any error, loss or other consequence which may arise from you relying on any information in any Mallee Catchment Management Authority publication. The current landscape of the Mallee and its soils and landscape features are the result of geological processes that occurred over vast periods of geological time. The sea has flooded into the Murray Basin at least three times. The Murray Basin is an extensive sedimentary depression containing depositions of Cainozoic sediments some hundreds of metres thick which mantle a basement of complex ancient hard geology. These sedimentary depositions are composed of fresh water, marine, aeolian and evaporative sediments. A thin layer of more geologically recent Quaternary deposits now cover most of these sediments. The composition and structure of the underlying base rocks has influenced the character and pattern of the overlying sedimentary deposits. They also affect the present day movement of groundwater flow and surface discharge patterns (Bowler and Magee 1978). north-south trending sandstone ridges. In the western and central parts of the Basin, weathering of the Parilla Sand occurred. In the east of the Basin, freshwater sedimentation continued. These fluviatile and lake sediments are known as the Shepparton Formation. 1.1.2 Quaternary Period About 2 million years ago, major climatic change resulted in the series of glacial and interglacial periods of the Pleistocene Epoch and saw the development of the semi-arid landforms of the current Mallee landscape (Bowler 1982). Periods of aridity resulted in the weathering of Parilla Sandstone. In a section of the Basin, geological forces caused structural uplift, blocking river access to the sea and resulting in the formation of an ancient lake, Lake Bungunnia, and the depositing of freshwater, lacustrine (lake) clay and silt sediments. This deposition is known as the Blanchetown Clay. Blanchetown Clay is at its thickest beneath the Raak Plain. With arid conditions, this freshwater deposition stopped and Lake Bungunnia drained (LCC 1987). Most of the Murray Basin was at that time covered with a veneer of aeolian (wind deposited) and saline lake deposits. Erosion by the wind caused deposits of sands, silts and calcareous clay over much of the Basin. This deposition is known as the Woorinen Formation. The Woorinen Formation is the major formation of the dunefields of the Mallee and is characterised by low, linear east-west dunes interspersed with flat plains. Erosion of underlying Parilla Sand resulted in the high, siliceous, irregularly shaped dunes and sandplains of the Lowan Sand which occur in the Big Desert and the southern Sunset Country. Extensive saline lake deposits of laminated gypseous clay were laid down in the Tyrrell Basin and Raak Plain. Arid conditions encouraged the development of a system of varyingly aged lunettes which overlie the Blanchetown Clay to the east of Lake Tyrrell (Bowler and Magee 1978). In more recent geological times, alluvial sediments from the Shepparton Formation were deposited by the Murray and streams related to the present day drainage system. The present landforms of the Mallee are the result of these geomorphological processes. A landform is a geomorphological unit that is largely defined by its surface form and position in the landscape and is categorised by its physical elevation, slope, orientation, stratification, rock exposure and soils. Landforms in the Mallee Catchment are of two main geomorphic types: those formed by aeolian (wind) processes and those formed by alluvial (river and stream) processes. The Mallee Catchment lies primarily within two broad landform regions: the Riverine Plain to the east and the Mallee Dunefields. A small area centred around Birchip lies within the Wimmera Plain (ARI 2003). The Mallee dunefield is a gently undulating plain, where, for the most part, a mantle of aeolian deposits overlies Parilla Sand. Aeolian (wind formed) landforms – the dunes of the Woorinen Formation and the Lowan Sand - dominate the Mallee dunefield. The ephemeral lakes are vestiges of enfeebled or defunct drainage systems. Gypseous lakebeds (boinkas) mark a zone of waterdischarge (LCC 1987). The Riverine Plain encompasses the entrenched floodplain of the Murray. The major landforms of the Mallee are: •	North-South Ridges •	Linear Dunes •	Irregular Dunes •	Weakly oriented dunes •	Lunettes •	Plains •	Lake Basins •	Playas and Salinas •	Boinkas North-south ridges are a remnant of the north-south trending beach dunes/ ridges that formed as the sea retreated during the Pliocene era. These ridges vary in length from 1 km to over 50 km, range in height from 6 m to 40 m and are between 1 to 1.5 km in width. While they outcrop as sandstone ridges, many of these ridges are now covered with Woorinen Formation or Lowan Sand dunes (LCC 1987). Linear Dunes are the dominant landform of the Mallee dunefield. The majority of these dunes come from the Woorinen Formation. These Woorinen dunes are east-west oriented, low (2 to 10 m) with rounded crests and flanks, and regularly spaced. They typically run to around 1.5 km in length and range in width from 80 to 120 m. These dunes are comprised of reddish yellow or brown calcareous clays and sands and are relatively stabilised. Small areas of linear, siliceous, Lowan Sand dunes are also present. These are groups of a north-south to north-east to south-west trending dunes (LCC 1987). Irregular Dunes are siliceous dunes of the Lowan Sand. These dunes are often sharply curved and elongated and form nested parabolic groups (several ridges and crests overlapping). Their height normally exceeds that of the Woorinen Formation east-west dunes, with dunes commonly exceeding 30 m. These dunes are composed of loose, yellow quartz sand with very little clay content and highly prone to erosion when disturbed (LCC 1987). Extensive belts of Lowan Sand dunefields occur in the Sunset Country (Sunset Desert) and the Big Desert. Weakly oriented dunes are found extensively in the southwest of the Mallee. These are very gently sloping mounds, characteristically less than 500 m across. The general source for these is the Parilla Sand (LCC 1987). Lunettes are crescent-shaped dunes that occur on the eastern shore of lake basins. There are two types of lunettes associated with different periods of geological history: clay-rich lunettes and quartz sand lunettes. Lunettes vary in size, depending on the area of the lake basin from which they received their deposits. They range from only a few metres in height to over 40m at Lake Tyrrell (LCC 1987). Plains are mainly of two types: aeolian or alluvial formed. Small plains are frequent throughout the dunefields of the Mallee and are composed of clayey material from the Woorinen Formation and Lowan Sands (LCC 1987). Alluvial plains, modern floodplains, occur adjacent to the Murray River and major creeks of the region and around Ned’s Corner, where they are incised by older meanders and billabongs. In the south-east of the Mallee, plains of older alluvial deposits formed from the Shepparton Formation occur. Numerous channel remnants, cut-off meanders, terraces and shallow depressions mark the site of former stream channels (ARI 2003). Low-lying Lake Basins lie along current current and former drainage lines. Many of the lake basins are normally dry, with ephemeral flooding and/ or groundwater discharge occasionally occurring. Soils of these basins are composed of clays, silts and sands. Where lakes intersect with the groundwater, a salt-encrusted surface develops on the basin, as in Lake Tyrrell (LCC 1987). Boinkas are large groundwater discharge complexes that occur within broad depressions. Within these broad depressions, a range of individual landforms occur, typically: sand-plains, gypsum flats, copi hills, salinas and various dune types (LCC 1987). The Murray Basin is a closed sedimentary basin and a closed groundwater basin. Regional groundwater flows down basin from recharge areas in structural highs through a layered sequence of aquifers and aquitards toward zones of regional groundwater discharge toward the centre of the Basin. While part of the regional flow is lost to groundwater discharge basins, most of the flow continues downbasin to the Murray River (Bowler and Magee 1980). As the outlet for all through-flowing regional groundwater, the Murray River receives all the salt moving through regional groundwater systems. There are three main regional aquifers in the Mallee region: 1 The Renmark Group aquifer is the deepest aquifer and occurs throughout the dryland area. It has variable salinity. 2 The Murray Group (Duddo Limestone) aquifer overlies the Renmark Group aquifer west of Manangatang. The salinity of the groundwater is low west and south of Murrayville, with salinity increasing rapidly east of this location. 3 The Pliocene (Parilla Sands) acquifer occurs throughout the Mallee dryland area. This aquifer is highly saline and is the shallowest of the regional aquifers. It contains the water table at depths of 0 (at surface) to 40 m. Regional groundwater discharges as small salinas and the larger boinkas in the Sunset country. These regional aquifers are generally isolated from each other by aquitards, thick clay layers which reduce or stop the movement of groundwater. The exception is east of Manangatang, where groundwater from the Pliocene (Parilla) Sands aquifer mixes with groundwater at the top of the Renmark Group aquifer (MCMA, n.d.). There is a fourth, less extensive aquifer which is known as the perched water table aquifer. This aquifer occurs in the sandy soils of the Woorinen Formation overlying Blanchetown Clay. This is the shallowest of all the aquifers. It is recharged by rainfall that drains through the dune sands that has not been intercepted by the plant root zone (MCMA, n.d.). The massive clearing of vegetation for agriculture in the Mallee has upset this hydrogeologic balance. Subsequent to the clearing of deep-rooted perennial vegetation which intercepted rainfall, the amount of rainfall reaching the water tables of the Pliocene (Parilla) Sands aquifer and the perched watertable aquifer has increased and caused these water tables to rise. The natural hydrological processes operating in the Mallee Catchment have been substantially altered since European settlement with significant impacts on the riparian, floodplain and wetland ecosystems of the region. Changes to the flooding regime include the timing, frequency, magnitude and duration of floods. Water flow in rivers and streams has been reduced and the flooding regimes of lakes and wetlands has been altered (MCMA 2006). The region covered by the Mallee CMA contains portions of four river basins, the primary basin being the Mallee Basin. It also contains portions of the Avoca Basin, the Wimmera Basin and the Millicent Coast Basin. The northern part of the Mallee region is dominated by the Murray River, which is conjoined by anabranches and has an extensive system of wetlands. In the south part of the Mallee, the north-flowing streams, the Yarriambiack and Outlet Creeks, of the Wimmera River terminate in the large wetland complexes of Wirrengren Plain, Lake Corrong and Lake Lascelles. In the south-east, two streams of the Avoca River system, Tyrrell and Lalbert Creeks empty into saline wetlands, including Lake Tyrrell and Lake Timboram (MCMA 2006). These two creeks functioned as important and effective flood flow paths during the 2010/11 floods. Prior to the 2010/11 floods, Dunmunkle Creek had been mapped as an intermittent stream of the Wimmera River. Flood response mapping undertaken by the Mallee CMA has found that Dunmunkle Creek is two separate systems: one flowing from the Avoca River and one flowing from the Wimmera River. Dunmunkle Creek functions more like an overland flow than a defined creek, flowing during major flood events into Green Lake, south of Sea Lake (L. Searle. 2012, pers.comm.,16 May). Historically, the Murray River had variable natural flows, with large areas drying to a series of isolated pools in times of low flows. The natural flow regime of the Murray has been modified by the construction and operation of a series of weirs and upstream storages. Since 1922, thirteen weirs have been built across the Murray to regulate river flow (MCMA 2006). of Walpolla Creek, while another Lock causes ponding in the lower part of the Creek. This has altered the wetting and drying phases of many ephemeral wetlands by either permanently inundating them or restricting flow (MCMA 2006). Under natural flow regimes, Kingâ&#x20AC;&#x2122;s Billabong experienced periodic drying which was important in maintaining bird diversity. There is now permanent inundation of some of the wetlands which has killed small stands of River Red Gum and Black Box verging the wetlands (LCC 1987). There has been substantial modification to the hydrological regime of the Hattah Lake system, following regulation of the Murray. The Hattah Lakes fill only during high floods on the Murray, when waters enter Chalka Creek which then goes on to fill the lakes. Once flow in the Chalka Creek stops, the Hattah Lakes dry up. The result of flow regulation has been a reduction in Winter / Spring flood peaks and a reduction in flooding and inflow frequency, with serious disruptions to the Hattah Lakes ecosystems (MCMA 2006). (Hattah Lakes will be flooded under the Living Murray Project.) Flow changes in Outlet Creek and Yarriambiack Creek As in the Murray, the natural flow of the Wimmera River has been modified, with large diversions for agriculture. This has reduced flow frequencies of the Outlet and Yarriambiack Creeks. Outlet Creek is generally dry until it is filled by overflowing waters from Lake Albacutya. Lake Albacutya only fills when the Wimmera River experiences high river flows. Recent studies suggest the wetting cycle of Lake Albacutya has been reduced from 1 in 20 years to 1 in 100 years under river regulation (MCMA 2006). Weirs and other structures have been constructed in the channel of Yarriambiack Creek to retain and control flows, restricting the amount of water that flows into Lake Lascelles and Lake Corrong. Flow changes in Tyrrell Creek and Lalbert Creek The Avoca River is the least regulated of the three rivers and has no major dams but flows are modified by changes in catchment run-off characteristics and construction of levee banks. Both Lalbert Creek and Tyrrell Creek are threatened by inadequate water flow regimes (MCMA 2006). Lalbert Creek fills every two to three years but construction of levees along the Creek has resulted in wetlands remaining dry for longer periods than they would under natural conditions. Construction of levees along Tyrrell Creek also results in its associated wetlands remaining dry for longer than under natural conditions (LCC 1987). WHAT IS A LAND SYSTEM? A land system is a broad scale geomorphic unit which integrates a range of environmental factors, including rainfall, geology, landforms, soils and indigenous vegetation. Land systems map the terrain patterns which are generated by climate, geology and landforms and their interaction over time to influence the distribution of soils and native vegetation. Each land system is a complex of particular land components which vary little within that particular land system. Because land systems bring together and integrate so many elements which are relevant to the sustainable use of land, they are extensively used in land management at a regional scale. Land systems are good indicators of the broad types of soils and associated vegetation types which are likely to be present in an area. They are useful in indicating the agricultural capability of the land, and the types of hazards – wind and water erosion, scalding, salinity, flooding – to which that land is subject. Land systems can also be used to predict broadscale susceptibility to rabbit invasion, as land systems with sandier soils are likely to harbour more rabbits than land systems with heavier soils. strongly supported and assisted by Jim Rowan and John Martin. This mapping breaks the region up into fine scale components. Examples of landform components are linear dunes, copi islands, prominent lunettes and so on (Figure 3). A landform component is the basis for defining ‘likely’ soil occurrence and is therefore a more effective unit to assess land management. Land degradation can be monitored with greater certainty. This dataset covers all private land in the Mallee, as well as public land in the Ned’s Corner, Tyrrell Creek, Murray River Floodplain and Raak land systems. 3.5 WIND EROSION SUSCEPTIBILITY These landform components have been used to model with precision the susceptibility to wind erosion of land across the Mallee. The soils of the Mallee, combined with low annual rainfall and strong winds, make the region the most wind erosion prone in the State (Lorimer 1985). In 2011, DPI utilised the landform component mapping to model wind erosion susceptibility in the region at a resolution previously unavailable (Hopley et al. 2011). Soils consist of weathered rock particles and organic matter. Soil characteristics are determined by the nature of the parent rock, in combination with topographic, climatic and biological factors. Much of the Mallee is covered by sandy/ sandy loam soils deposited from the Tertiary. While occasional outcrops of ‘parilla’ sand occur, these sandy soils are primarily derived from the Woorinen Formation and the Lowan Sand (ARI 2003). The dunes of the Lowan Sand that dominate the Big Desert and are found in parts of the Sunset Country are very poorly developed soils with little organic content. The grayish-yellow to white deep sands have little clay content or lime. They are nutrient poor, permeable and drain deeply (Gibbons and Rowan 1993). Soils in the Woorinen dunes are more fertile. They have more clay content, particularly with depth. They are calcareous and slightly alkaline. The fertile soils on the plains between the dunes are gradational or duplex and are mainly made up of sandy loams overlying sandy clays (ARI 2003). Lime is present, occurring as either fine earth or nodules. These soils are highly alkaline. Other soils on the plains are clayey throughout and, in low basins on the plains, soils which are saline at, or near the surface, occur. These latter soils often contain deposits of gypsum (Gibbons and Rowan 1993). Extensive alluvial deposits occur on the alluvial plains associated with past and present river systems. These soils are mainly grey, calcareous, sodic soils without marked differentiation into surface and subsurfaces. These clays are generally alkaline, particularly at depth. Highly fertile red clays with a higher salt concentration in their subsoils also occur (ARI 2003). (Most of the following information, other than vegetation information, is adapted from the Department of Primary Industries’ (DPI’s) Victorian Resources Online website.) Five main soil categories occur in the Mallee region, with each of these soil categories having one or more soil groups or orders. These soil categories are: • Texture Contrast Soils • Cracking Clay Soils • Sandy soils • Wet Soils • Calcareous Earths Figure 4 (next page) shows the distribution of broad soils types across the Mallee. Texture contrast soils have a strong texture contrast between the surface (A horizons) and the subsoil (B horizons) e.g. sand or loam over clay. These soils were, and still are, commonly referred to as duplex soils. Subsoils are much more clayey than surface soils. Subsoils are sodic but not strongly acid. The surface texture of these duplex soils ranges from sandy loam to clay loam over medium to heavy clay. These soils are often liable to scalding. Sodosols can be separated on the basis of the top 20 cm of the subsoil. Red sodosols are the most extensively distributed soils in the Mallee. The other sodosols are Brown, Yellow, Grey and Black. Red sodosols have loamy surface soils overlying red sodic clays and occur on older alluvial terraces. They were formed by the layering of wind-deposited soils (parna) and alluvium. They can also occur on lunettes in the Tyrrell Basin. In the southern Mallee, sodosols can be found near creeks and rivers, often where the original vegetation of grassy Casuarina woodlands contrasts with the surrounding Mallee vegetation. Erosion has frequently removed the surface horizon to expose red, saline clays that seal on wetting. Ridged Plains Mallee (EVC 96) is associated with these sodosols. The higher terraces near the Murray River are also subject to scalding. Red sodosols here support large areas of Low Chenopod Shrubland (EVC 102) and degraded remnants of the non-eucalypt woodland, Semi-arid Chenopod Woodland (EVC 98). The grey cracking clays of the Murray floodplain are also coarsely structured but not sodic. Some subsoils are naturally slightly saline but salinity has increased in many of these soils due to rising watertables and reduced flooding. Moisture levels in these soils in the semi-arid climate of the Mallee present several obstacles to vegetation. Plant available water is lower than in sandier or loamier soils. Also, the water-content of the soil below wilting-point for plants (i.e.not available to plants) is very high. These soils often dry out to well below wilting-point and require a lot of water before water again becomes available to plants (Gibbons and Rowan 1993). The most widely distributed Ecological Vegetation Classes (EVCs) associated with the grey cracking clays of the Murray floodplain are Riverine Chenopod Woodland (EVC 103), Lignum Swampy Woodland (EVC 823), Lignum Shrubland (EVC 808) and on higher terraces Low Chenopod Shrubland (EVC 103). These soils are classified as Vertosols using the Australian Soil Classification. are distinguished by the level of soil development. Rudosols show little soil development other than loose surface accumulation of organic matter. These are the white sands of the high, jumbled dunes and sandplains of the Big Desert. They also form a band of east-west dunes in the Sunset country north of the area between Ouyen and Murrayville. These aeolian sands were formed in a fairly recent period of geologic history. These sands have very low fertility and are highly prone to erosion. Tenosols are weakly developed and there is some subsoil development. These soils are associated with older, east-west, more closely spaced dunes which are interspersed with the dunes of the white sands. The pale surface horizons are deep, loose siliceous sands. The subsoil horizons have some accumulation of clay, are more compacted than the surface horizons, and are reddish in colour. These soils have low fertility and are highly prone to erosion. The chief feature affecting the distribution of the vegetation is the nutrient status of the soils. Heathy Mallee (EVC 88) and heathlands are found on the extremely infertile Rudosol soils. EVCs like Loamy Sands Mallee (EVC 91) are more prominent on the more fertile Tenosol soils, particularly in the Central Mallee and Sunset Country. 4.2.4 Wet Soils (Hydrosols) Wet soils occur naturally in low-lying areas of the central and northern Mallee where saline regional groundwaters outcrop. These soils are either permanently saturated or saturated for several months. They are often associated with former lakebeds. These soils are saline. The degree of surface salinity depends largely on the depth to the watertable. Wet soils which are saline to the surface are often red clay loams overlying gypsum. Soils which are highly saline at depth but non-saline on the surface usually have a sandy surface. Highly saline soils are either devoid of vegetation or have salt-tolerant, semi-succulent vegetation communities. Samphire Shrubland (EVC 101) is a widespread EVC occurring on these soils. Saline shrubland is now common on soils which previously supported other less salt-tolerant vegetation communities. The area of these wet soils has expanded significantly in both dryland and irrigated areas in the Mallee due to extensive clearing of deep-rooted native vegetation and rising saline watertables. These wet, salty soils are classified as Hydrosols by the Australian Soil Classification. subsoil horizons. They often have accumulations of calcium carbonate (lime) in the soil profile, with lime often extending to the surface in heavier textured soils. Clay content increases gradually with depth. These soils tend to be highly alkaline, although the upper horizons of sandier calcareous earths may be only weakly alkaline. Sodicity and salinity are usually high in the heavier subsoils. Soil texture varies depending on the proportion of clay and sand particles. Calcareous earths in the Mallee vary considerably in texture. Calcareous earths have been classified into three groups depending on their texture: soils with heavier textured (clay loamy-clay) surface soil, soils with light textured (sandy to loamy) surface soil and stony soils with shallow profiles overlying hard calcrete layers. Light textured calcareous earths predominate in the northern Mallee where east-west dunes alternate with broad swales. The soils in the swales and north-south and north-south trending ridges have loamy surfaces overlying often sodic soils. Sands are more common on the east-west dunes. Heavy textured calcareous earths predominate in the south of the region on the plains, stranded ridge crest, and sub-round hummocks. Heavier textured soils with a clay loam to clay surface predominate on the plains and lower slopes of the hummocks. Soils on the upper hummock and stranded ridge crest have loamy soil. Stony calcarols have shallow loamy horizons that give way to a solid, thick limestone layer commonly within 30 cm of the soil surface. The soils have relatively low water holding capacity due to the shallow depth and stone component. These stony soils predominate on loamy agricultural soils in the western Mallee and are widespread but discontinuous between Underbool and Murrayville. They also occur in a section of Murray-Sunset National Park. Native vegetation on these soils has been extensively cleared for agriculture, particularly that occurring on the less alkaline, light textured soils. The light textured calcareous earths are very prone to erosion when cleared. Heaviness of texture influences the distribution of the Mallee shrublands and woodlands and non-eucalypt woodlands that occur on these soils. Both Woorinen Sands Mallee (EVC 86) and Woorinen Mallee (EVC 824) can occur on the lighter soils but Woorinen Mallee was once fairly extensive on heavier soils. Semi-arid Woodland (EVC 97) also occurs on the less alkaline, lighter calcareous earths. On the heavier soils of the south, the â&#x20AC;&#x2DC;large Malleeâ&#x20AC;&#x2122; species, Bull Mallee (Eucalyptus behriana) and Black Mallee-box (E. porosa), of Ridged Plains Mallee occur (Gibbons and Rowan 1993). Calcareous soils are classified as Calcarols using the Australian Soil Classification. BIOREGIONS What is a Bioregion? Bioregions are a landscape-scale approach to classifying the land surface and reflect natural boundaries in the landscape. A Bioregion is a geographic area characterised by a combination of physical and biological characteristics such as: •	geomorphology/	landforms	•	geology •	soils •	climate •	vegetation Bioregions interlink broad geophysical patterns with environmental processes and ecological characteristics at a landscape-scale. The landscape-scale of bioregions makes them a useful way to analyse broad patterns of biodiversity, including the distribution patterns of flora and fauna. As such, bioregions are used as the basic unit for regional-scale, state and national biodiversity conservation planning and their strategic frameworks. The conservation status of ecological communities, Ecological Vegetation Classes (EVCs) (See 5.2) and flora and fauna species are evaluated within a bioregional framework. Bioregions are the mapping units adopted in the federal Environment Protection and Biodiversity Conservation Act 1999 (EPBC Act) and Victoria’s Biodiversity Strategy (DSE 1997). Bioregion mapping is scale-dependent and Victoria’s bioregions nest within the coarser-scaled national bioregions mapped by the Interim Biogeographic Regionalisation of Australia (IBRA). Six bioregions have been mapped for the Mallee Catchment (Figure 5, next page) and these sit within two extensive bioregions which have been mapped at the national level (Table 1). with lake beds and creek systems (Gibbons and Rowan 1993). Samphire shrublands occur on the saline soils of the Raak Plain. This bioregion includes part the Murray-Sunset National Park and several significant Flora and Fauna Reserves, including Yarrara (Figure 6). Yarrara Flora and Fauna Reserve contains the most intact stands of belah in the Mallee region. Given this bioregionâ&#x20AC;&#x2122;s relatively fertile soils, much of its vegetation has been cleared. It is estimated that 26% of its pre-settlement vegetation remains (MCMA 2008). Consequently, many of its EVCs are classified as depleted (six EVCs), vulnerable (14 EVCs) or endangered (nine EVCs). Figure 6. Parks, reserves, state forest and other public land in the Mallee Catchment The Murray Mallee bioregion contains a variety of soil types, some of which are highly prone to erosion when cleared. characteristic of heavier loamy soils. The Big Desert is contained within the Lowan Mallee bioregion and features several heathy Mallee and heath vegetation communities. The Lowan Mallee bioregion covers some 1,128,500 ha. It is characterised by an extensive undulating siliceous sandy plain (Lowan Sand) where overlying siliceous sands form a complex array of jumbled and parabolic tall dunes, and east-west dunes with plains of deep white siliceous sand. Soils are typically nutrient-poor leached sands or, in the swales, mottled yellow and grey texture soils. Given this bioregion’s infertile soil, this is the Mallee Catchment’s least cleared bioregion, with an estimated 92% of its pre-settlement vegetation remaining (MCMA 2008). Much of it is now reserved as National Parks in the Big Desert, Wyperfeld and Murray-Sunset National Parks (Figure 6). The Lowan Mallee soils are classified as having a very high erosion susceptibility. degraded and eucalypt riverine woodlands on freehold land have been degraded by grazing. Many of its EVCs are classified as vulnerable (nine EVCs) or endangered (two EVCs). The Robinvale Plains bioregion encompasses the southern Murray River floodplain between the Wakool River junction to 5 km upstream of Merbein and covers some 62,218 ha. It is characterised by an ancient riverine plain of the Murray River and a narrow gorge confined by the cliffs of the Murray River. This gorge is entrenched within older Cainozoic sedimentary rocks. Alluvial-deposited soils are red-brown earths, cracking clays and texture contrast soils. This bioregion includes the Hattah Lakes and Chalka Creek system, which are recognised under the Ramsar Convention on Wetlands (1971) as a wetland of international significance. The bioregion contains 40,000 ha of Crown Land and includes Kingâ&#x20AC;&#x2122;s Billabong, areas of Hattah-Kulkyne National Park and MurrayKulkyne Regional Park, state forests and Murray River Public Purpose Reserves (MCMA 2006) (Figure 6). The Robinvale Plains bioregion accounts for around 2% of the Mallee Catchment. Approximately 85% of its vegetation is mapped as remaining, with some of this being used for grazing. Many of its EVCs are classified as vulnerable (nine EVCs) or endangered EVCs (four EVCs). 5.2 ECOLOGICAL VEGETATION CLASSES 5.2.1 What are Ecological Vegetation Classes? In Victoria, Ecological Vegetation Classes (EVCs) are the basic units for the regional and state-wide mapping of native vegetation and are used for biodiversity planning and conservation management at the regional scale. They were introduced in 1994 in response to a perceived need for a unit which could map vegetation at a landscape level to include broad environmental attributes such as climate, soils and topography (ARI 2003). EVCs are a broader method of classifying and mapping the continuum of vegetation than floristic communities, which are groups of characteristic species which co-occur in association. An EVC may comprise one or a number of floristic communities depending on geographic and bioregional variation, and variation within the EVC itself. For example, Riverine Chenopod Woodland (EVC 103) has two distinctive variations: the more widespread Black Box - Chenopod Woodland where the overstorey is dominated by Black Box with a chenopod (saltbushes, bluebushes etc) understorey; and the Black Box - Moonah Woodland where moonah (Melaleuca lanceolata) dominates the overstorey and Black Box is occasional, which occurs at Lindsay and Mulcra Islands (ARI 2003). The Department of Sustainability and Environment (DSE) has produced two map products which model extant (existing) EVC distribution and pre-1750 EVC distribution. The EVC mapping has been modelled at either 1:100 000 or 1:25 000 scale and care must be undertaken when applying this mapping at a site scale. Table 2 illustrates how environmental attributes such as soil type, position in the landscape, geomorphology (landform) and altitude, ecological processes such as flooding (including its frequency and amplitude), and the structural characteristics and dominant life forms of vegetation are used to construct EVCs. The Mallee CMA has copies of these two GIS layers. The DSE also hosts the Biodiversity Interactive Map on its Mapshare. This is a very useful map. It has layers showing the extant and pre-1750 EVC distribution, as well as other layers relating to the bioregions, the connectivity of vegetation remnants, rare and threatened fauna etc. The conservation status of an EVC is assessed within a bioregional context. This is termed an EVC’s Bioregional Conservation Status (BCS). This conservation status is based on the depletion of an EVC’s current extent when measured against an estimation of its pre-1750 extent, and the level of degradation in condition typical of its existing stands (Platt and Lowe 2002). Rankings of BCS and their definitions are listed in Table 3. A broader level of vegetation classifications used are Simplified Native Vegetation Groups. These are sometimes referred to as Broad Vegetation Types. These groups have been derived from grouping similar EVCs together. For example, Mallee forms one Simplified Native Vegetation Group (Group 17) and is comprised of 10 EVCs (DSE 2007). The map opposite (Figure 7) shows the Broad Vegetation Types of the Mallee. 5.2.4 EVC Benchmarks A ‘benchmark’ represents the average characteristics of a mature and apparently long-undisturbed vegetation stand of that EVC. EVC ‘benchmarks’ are also constituted within a bioregional context. The condition of the vegetation at any given site is standardly evaluated by separating the vegetation into its component EVCs and then comparing each EVC to its bioregional ‘benchmark’ (DSE 2004). EVC bioregional benchmarks can be found on the DSE website. 5.3 KEY LEGISLATION FOR THE PROTECTION AND MANAGEMENT OF BIODIVERSITY 5.3.1 National Legislation The Environment Protection and Biodiversity Conservation Act 1999 (EPBC Act) is the Australian Government’s central piece of legislation for the protection of the environment, the conservation of biodiversity and the promotion of the ecologically sustainable use of natural resources. It provides a legal framework to protect and manage nationally important flora and fauna species, ecological communities, migratory species, world and national heritage places and wetlands of international importance (commonly referred to as ‘Ramsar wetlands’). The EPBC Act provides for the identification and listing of flora and fauna species, ecological communities and native migratory species as nationally threatened. Listed flora and fauna species are categorised as: extinct, extinct in the wild, critically endangered, endangered, vulnerable or conservation dependant (See Table 4, Page 24). Listed ecological communities are categorised as critically endangered, endangered or vulnerable. * or a combination of depletion, loss of quality, current threats and rarity that gives a comparable status The Bioregional Conservation Status of an EVC can be found on the DSE website. Communities) and undergo an environmental assessment and approval process. Such actions are termed â&#x20AC;&#x2DC;controlled actionsâ&#x20AC;&#x2122; and include activities such as earthworks, extraction and diversion of water, vegetation clearance and agricultural activities. Recovery plans and conservation advice for many of the listed species and ecological communities have been developed within the EPBC Act framework. Threat abatement plans have also been developed for reducing the impacts of key threatening processes. 5.3.2 State Legislation The Flora and Fauna Guarantee Act 1988 (FFG Act) is Victoriaâ&#x20AC;&#x2122;s central piece of legislation for the conservation of threatened species and communities and for the management of potentially threatening processes. It provides for the listing of flora and fauna species (including subspecies and varieties) and flora and fauna communities which are threatened (Threatened List), and potentially threatening processes (Processes List) in Victoria. There are no conservation status sub-categories (i.e. endangered, vulnerable) within the listing of species. Action Statements (management plans) have been developed for a number of listed species and are available from the DSE website. Table 8 lists the flora and fauna of the Mallee which are listed under the FFG Act as threatened. Table 9 lists the flora and fauna communities of the Mallee which are listed under the FFG Act as threatened. 5.3.3 Other Relevant Legislation The Wildlife Act 1975 establishes procedures to protect and conserve wildlife and to provide for the sustainable use of wildlife. All native animals are protected under this Act (unless declared unprotected). The Act establishes a licensing system to allow for the sustainable use of wildlife (e.g. duck hunting). The Catchment and Land Protection Act 1994 (CaLP Act) has as its objective to establish a framework for the integrated, coordinated management of catchments which will maintain and enhance long-term productivity while also conserving the environment. It aims to ensure the quality of the Stateâ&#x20AC;&#x2122;s land and water resources and their associated animal and plant life. The CaLP Act is the major piece of legislation covering the control and management of noxious weeds and pest animals on private and public land in Victoria. Under this Act, plant and animal species can be declared as noxious weeds or pest animals. Four categories of noxious weeds are defined under the Act: state prohibited, regionally prohibited, regionally controlled and restricted. The Act defines the roles and legal responsibilities of land owners with regard to noxious weed and pest animal control. The CaLP Act stipulates that land owners must take all reasonable steps to eradicate regionally prohibited weeds, prevent the growth and spread of regionally controlled weeds, and control pest animals on their land. 5.4 VICTORIAN RARE OR THREATENED SPECIES (VROTS) DSE maintains an advisory list of flora and fauna which are considered to be rare or threatened within Victoria. This list is important for guiding regional-scale conservation planning and is used in setting priorities for actions to conserve biodiversity. Unlike the FFG Act, this is not a statutory list and there are no legal requirements or responsibilities that follow on from a species being listed. The Advisory List of Rare or Threatened species in Victoria (VROTS) can be accessed on the DSE website. The Victorian Mallee contains approximately 355 species of flora and 133 species of fauna which are listed as rare or threatened (MCMA records). The Planning and Environment Act 1987 sets out principles for land-use and development planning, and policies for settlement, environment and management of resources. The objective of the conservation of native flora and fauna policy is to assist the protection and conservation of biodiversity, including native vegetation retention and provision of habitats for native plants and animals. The Act contains provisions to protect native vegetation on private land and regulate the clearing of native vegetation, including treeless vegetation. Victoriaâ&#x20AC;&#x2122;s Fisheries Act 1995 provides a framework for the regulation, management and conservation of Victorian fisheries, including aquatic habitats. The Act enables threatened aquatic flora and fauna species and communities to be declared as protected aquatic biota. Under this Act, aquatic flora and fauna species can be declared as noxious aquatic species (e.g. Carp) and the Act is the major piece of legislation covering the control and regulation of noxious aquatic species. The Water Act 1989 governs the allocations of water entitlements in Victoria, including environmental entitlements. The Act is responsible for the setting up of the Environmental Water Reserve, water set aside for the environmental purposes of improving the values and health of aquatic ecosystems, including their biodiversity, ecological functioning and water quality. The vegetation of the Mallee evolved in conditions of fluctuating aridity (Bowler 1982) and the semi-arid climate is the major influence on the flora of the Mallee. The Mallee region now receives a mean annual rainfall of approximately 400 mm in its south to less than 250 mm in the far north-west. Evapotranspiration is high and evaporation commonly exceeds rainfall. Conditions of aridity have fluctuated when considered over geological timescales. Pollen records taken from Lake Tyrrell in north-west Victoria indicate broad changes in the dominance of certain plant families over the last 10,000 years as rainfall levels change (ARI 2003). The Casuarinaceae family, which includes Belah (Casuarina pauper) and Buloke (Allocasuarina luehmanii), were dominant in relatively dry periods. With increases in rain, there was an increase in Callitris (native pine) and Eucalyptus species. Dense mallee vegetation established around 800 years ago, when conditions were also wetter (ARI 2003). Flora species have many adaptations to deal with prolonged periods of little or no rainfall. Two important adaptations which relate to aridity are suckering, and seed dormancy and germination triggers. As seedlings and juveniles are the most susceptible to dessication, overstorey tall shrubs and trees, like Cattle Bush (Alectryon oleifolius subsp. canescens) and Sugarwood (Myoporum platycarpum) can reproduce by vegetative reproduction i.e. suckering. This regeneration strategy allows the young plant to utilise the protection and resources of the mature tree and to access deeper water moisture than a seedling could access. Soil moisture is the major limiting factor for successful seed regeneration and seedling establishment in the Mallee. Seed germination of Slender Cypress-pine (Callitris gracilis subsp. murrayensis) is linked to periods of increased soil moisture i.e. higher than average rainfall. Many annual species survive in seed stage during drought, and germinate and grow in moist seasons. woodlands of the Big Desert, rely completely on fire for regeneration. Hot fires are required to open the tightly sealed woody capsules of the Banksia cones. Fire is required to maintain the biodiversity of many mallee and heath communities. In mallee communities, fire produces a flush of annuals and short-lived perennials, some of which are apparently absent in the communities in the absence of fire. Species richness also increases dramatically in heathlands after fire. Over the two decades after fire, the number of species growing in heathland declines by 30% to 40% (LCC 1987). The extreme, long-term absence of fire in heathland communities also causes a structural change in the community, with the understorey shrub, Scrub Cypress-pine (Callitris verrucosa), dominating these former heathlands (LCC 1987). Several vegetation communities, however, do not have adaptations to fire. Apart from Moonah (Melaleuca lanceolata subsp. lanceolata) and Weeping Pittosporum (Pittosporum angustifolium), woody species in Belah, Pine and Buloke woodlands, including these overstorey species, are killed by fire. In the context of the fragmented landscape of the Mallee today, fire poses a serious threat to many small remnants of these woodlands (Sluiter et al.1997). Other communities which do not have adaptations to fire include the chenopod shrublands found on the alluvial terraces of the Murray (LCC 1987). Mallee shrublands and woodlands are the dominant vegetation of the Mallee region. Mallee eucalypts are characterised by their growth form where several slender trunks arise from a single large underground tuber (the Mallee ‘root’) (LCC 1987). There are a large number of different Mallee EVCs and vegetation communities which occur on different soils and landscape positions. Bluebush (M. brevifolia), Cottony Saltbush (Chenopodium curvispicatum), Frosted Goosefoot (C. desertorum), Copperburrs (Sclerolaena spp. ), Hedge Saltbush (Rhagodia spinescens) and Twin-leafs (Zygophyllum spp.). The succulent species, Rounded Noon-flower (Disphyma crassifolium subsp. clavellatum), is also often present. Woorinen Sands Mallee (EVC 86) occurs where surface and sub-surface soils have a higher siliceous sand content than those of Woorinen or Chenopod Mallee. It forms an open shrubland to 7 m in height, with an understorey dominated by the Hummock Grass, Triodia scariosa (commonly referred to as either Porcupine Grass or Spinifex). It typically lacks many of the chenopod shrubs found in the heavier soils of the other two EVCs. The dominant overstorey mallees are Dumosa Mallee, Slender-leaf Mallee (E. leptophylla) and Grey Mallee. The open tall shrub layer may include Scrub Cypress-pine, Moonah and Sugarwood. It has a diverse array of small shrubs including Rough Halgania (Halgania cyanea), Dwarf Nealie (Acacia wilhelmenia), Small Hop-bush (Dodonea bursarifolia), Stiff Westringia (Westringia rigida). Rushes (Lomandra spp. ), a diverse array of herbs and scattered speargrasses (Austrostipa spp.) are present in the groundlayer. Siliceous Dunefields and sandplains Heathy Mallee (EVC 88) occurs on deep Lowan sandplains and dunefields and occurs widely in the Big Desert. Soils are deep, loose, coarse siliceous sands. It forms a low Mallee shrubland to 4 m with a ‘heathy’ understorey typical of nutrient-deficient, acid soils. The dominant mallees are Yellow Mallee (E. incrassata) and Slender-leaf Mallee. Its dense and species-rich understorey includes species like Scrub Cypress-pine, Dwarf Sheoak (Allocasuarina pusilla), Slaty Sheoak (A. muelleriana), Broom Baeckea (Babingtonia baeckea), Desert Banksia (Banksia ornata) and Heath Tea-tree (Leptospermum myrsinoides). Porcupine grass is an important component of the understorey, with the small shrublayer containing numerous heathy sub-shrubs: Beard Heaths (Leucopogon spp. ), Cranberry Heath (Astroloma humifusum), Flame Heath (A. conostephioides), Red Parrot-pea (Dillwynnia hispida), Mitchell Bertya (Bertya mitchellii), Leafless Bitter-pea (Davesia brevifolia) and Bush-peas (Pultenaea spp.). Loamy Sands Mallee (EVC 91) grows on heavier soils than Heathy Mallee, occurring on yellow siliceous sands in the Sunset Country and parts of the northern Big Desert (Figure 6). It forms a low Mallee shrubland to 4 m, with Yellow Mallee and Slender-leaf Mallee being the dominant canopy species. The understorey has a lower diversity of heath species and a more extensive cover of porcupine grass than does Heathy Mallee. Typical understorey species include grey Mulga (Acacia brachybotra), Small Cooba (A. ligulata), Broom Ballart (Exocarpus sparteus), Broom Baeckea, Small Hopbush and, in long unburnt vegetation, Scrub Cypress-pine. shrubland to low woodland to 7 m. The dominant canopy species is Desert Stringybark (E. arenacea). It has a heathy understorey with typical species of the shrublayer including Heath Tea-tree, Banksia spp, Sheoaks (Allocasuarina spp. ), Desert Hakea (Hakea mitchellii) and Common Fringe-myrtle (Calytrix tetragona). The medium shrub layer is diverse and sedges, rushes (Lomandra spp.) and Austral Grass-tree (Xanthorrhoea australis) figure prominently in the understorey. 6.3.3 Mallee shrublands and Woodlands: Parilla Sandstone Ridges and Rises A distinctive suite of Mallee shrubland and woodland vegetation communities and EVCs occur on sandstone ridge outcrops and the dunefields underlain by Parilla sandstone ridges. These include the whipstick mallee shrubland Red Swale Mallee (EVC 95), the low, open mallee and Broombush (Melaleuca uncinata) Sandstone Ridge Shrubland (EVC 93), and the endangered woodland, Parilla Mallee (EVC 981). Parilla Mallee occurs on topographic high points where ‘loose’ drifts of loamy sand cover broad weathered sandstone ridges. This type of vegetation was once extensive in the central Mallee, particularly in the Patchewollock, Speed and Tempy areas. It has been widely cleared for cropping and less than 5% of it remains. Remaining remnants are often invaded by exotic grasses. It is classified as endangered in the Murray Mallee, Lowan Mallee and Wimmera bioregions, the three bioregions in which it occurs. Parilla Mallee is a tall, open mallee woodland to 10 m in height, with Grey Mallee, Oil Mallee and Dumosa Mallee as dominant species. A distinctive small tree layer of Slender Cypress-pine is present over a large shrub layer. The understorey is highly variable, and appears to be influenced by surrounding land-use and fire history. In relatively intact remnants, the groundlayer is characterised by grasses and a particularly rich suite of annual herbs. 6.3.4 Mallee woodland: Clay Plains Ridged Plains Mallee (EVC 96) is classified as endangered and also occurs in association with subdued Parilla Ridges but on plains where the soils have a high clay content. Typically, soils are duplex with grey or brown sandy clay loam or clay loam topsoils which change to fine textured clays within 30 cm. This open, grassy woodland was once extensive in the southern Mallee, with scattered occurrences on heavy soils in the central Mallee and Manangatang areas. Only around 5% of this vegetation type now remains, with most remnants occurring in roadside reserves. While Bull Mallee (E. behriana) and Dumosa Mallee typically dominate in most of this EVC’s range, Black Mallee-box (E. porosa), Belah and Buloke may also be dominant overstorey trees. The understorey is highly variable and reflects both local environmental conditions and prior land-use. A small tree/ tall shrub layer may be present. Typical species of this stratum include Weeping Pittosporum, Umbrella Wattle, Myall (Acacia melvillei), Sugarwood and Cattle Bush. The medium and small shrub layer contains species characteristic of both heavy soils and lighter soils: Desert Cassia, Common Emu-bush, Hedge Saltbush, Hakea Wattle (A. hakeoides), Leafless Bluebush (Maireana aphylla) and Rorhlach’s Bluebush (M. rohrlachii). A range of low to prostrate chenopod sub-shrubs is also commonly present. The groundlayer is dominated by Tussock Grasses and is particularly rich in Speargrass species some of which, like Flat-awned Speargrass (Austrostipa platychaeta) and Feather Speargrass (A. elegantissima), are indicative of heavy soils. Porcupine Grass, Sticky Sword-sedge (Lepidosperma viscidum), Black-rapier Sedge (L. carphoides) and Woolly Mat-rush (Lomandra leucocephela subsp. robusta). elevated areas can have an overstorey of Moonah with occasional Black Box (LCC 1987). Its shrubby understorey is characterised by a range of chenopod species such as Old-man Saltbush (Atriplex nummularia), Flat-top Saltbush (A. lindleyi), Nitre Goosefoot, Ruby Saltbush, Hedge Saltbush and Nodding Saltbush (Einadia nutans ssp. nutans). Native herbs, such as Pale Beauty Heads (Calocephalus sonderi), Variable Daisy (Brachyschome ciliaris) and Crassula species, and Rounded Noon-flower occur in the groundlayer. The groundlayer of this EVC has been heavily disturbed by grazing and frequently has a high proportion of introduced grasses. Lignum Shrubland (EVC 808) is an open shrubland which occurs on heavy, water retentive soils. Tangled Lignum and Nitre Goosefoot form the medium shrub layer and, in intact remnants, there is a diverse groundlayer of small chenopods and annual herbs. Lignum Wetland (EVC 104) is denser, with lignum typically reaching heights of 3-4 m. It occurs on backplains and shallow depressions on floodplains and on drainage lines, floodways and relict lakebeds. Soils are heavy cracking grey or black clays. The riverine forests, woodland and shrublands have been extensively degraded by grazing and reduced flooding frequency and amplitude. Perennial native grasses have been replaced by annual species in many understories and weeds are a prominent component of the groundlayer. Reduced flooding has seen changes in species composition, with species more characteristic of drier conditions frequently colonising understories where flood-stimulated or obligate wetland species had occurred. Increasing soil salinity further changes the species composition of these communities. The Mallee region once contained extensive stands of non-eucalypt woodlands dominated by Slender Cypress-pine, Buloke, Belah and Sugarwood. (In the extreme north-west corner, White Cypress-pine (Callitris columnaris) often replaced Slender Cypress-pine.) These woodlands have been extensively cleared as they typically occurred on fertile loam and clay soils, and Slender Cypress-pine and Buloke were harvested for timber. The major existing stands of these woodlands are now found in the Hattah-Kulkyne, Murray-Sunset and Wyperfeld National Parks and Yarrara and Mallanbool Flora and Fauna Reserves (Figure 6). Scattered timber reserves also contain stands of Pine-buloke woodland. The semi-arid non-eucalypt woodlands contain one ecological community, ‘Buloke Woodlands of the Riverina and Murray-Darling Depression Bioregions’, which is listed as Endangered under the EPBC Act and four communities which are listed under the FFG Act. Buloke is also listed as a threatened species under the FFG Act (See Section 5). viability of these woodlands is the lack of regeneration or successful recruitment of major overstorey species such as Buloke, Slender Cypress-pine and Sugarwood. As consecutive high rainfall years are necessary for the successful germination and recruitment of Pine and Belah, regeneration is spasmodic. Grazing of seedlings has been found to be an important factor in this lack of regeneration, with even very low numbers of rabbits inhibiting regeneration of woodland trees (Sandell 2009). It should be noted that the semi-arid non-eucalypt woodlands provide unique habitat for a range of fauna, including a number of rare or threatened species that occur only within these woodlands (See Section 7). 6.3.8 Chenopod Shrublands and Plains Grasslands The broad alluvial terraces of the Murray that occur west of Mildura to the South Australian border contain extensive areas of alluvial plain chenopod shrublands devoid of trees. (Chenopod shrublands also occur on relict lakebed surfaces such as Pine Plains). These shrublands have been extensively grazed, with the consequent decrease of palatable saltbushes and the increase of more grazing-resistant Copperburrs and Desert Glasswort (Pachycornia triandra). Rising saline groundwater also increases those species like Desert Glasswort and Three-horned Copperburr (Sclerolaena tricuspis) which are more tolerant of saline soils. Low Chenopod Shrubland (EVC 102) occurs on heavy soils on high alluvial terraces not subject to flooding. Soils are poorly draining, and are commonly grey to brown clays and duplex soils with loamy clays and loams above clay sub-soils. Soils are sub-saline. It is an open shrubland to 1 m. Species such as Dillon Bush (Nitraria billardiera), Bladder Saltbush and Three-horned Copperburr overlie a groundlayer of Rounded Noon-flower and annual herbs. On scattered red-brown sandy loam rises on the alluvial terraces, the shrubland is dominated by Shrubby Bluebush, Pearl Bluebush and Old-man Saltbush over a groundlayer of scattered Chenopods. These shrublands are often severely disturbed by rabbits as the sandier soils are highly suitable for warrens. Highly modified and extensively cleared, very little is now left of the once extensive Chenopod Grassland (EVC 829) which occurred on the heavy clays of alluvial terraces and low rises associated with clay lunettes. In this EVC, a more or less continuous layer of diverse native grasses occurred among scattered saltbushes and bluebushes. Very little is also left of Plains Grassland (EVC 132) that occurred on the poorly draining, red ‘parna’ soils around Birchip. Woody species are absent from this tussock grassland which is particularly rich in perennial herbs. 6.3.9 Halophytic (salt tolerant) Shrublands Samphire Shrubland (EVC 101) was once largely confined to salinas in low-lying evaporative basins (boinkas) where saline water tables were very close to the ground surface. Samphire shrublands are species poor, being composed primarily of Glassworts (Halosarcia spp.). Its floristic composition depends on the salinity of the site and gypsum content of the soil. It is now widespread due to rising saline groundwaters. It invades, and often replaces, adjacent vegetation communities like Low Chenopod Shrubland and other vegetation communities in low lying areas. 6.4 CURRENT EXTENT, DISTRIBUTION AND CONSERVATION STATUS OF EVCS AND VEGETATION COMMUNITIES ACROSS THE MALLEE LANDSCAPE The vegetation of the Mallee landscape has been extensively cleared, particularly those vegetation communities growing on the more fertile land and/or which were used for timber harvesting. Native vegetation across the Mallee once covered some 1,872,233 ha. Approximately 53% of this has been cleared. (MCMA 2008). Much of the remaining vegetation (1,319,304 ha) has been reserved, predominantly in large parks such as Murray-Sunset, Big Desert, Wyperfeld and Hattah-Kulkyne National Parks. Many of the vegetation communities found in these parks are on very infertile sands unsuitable for agriculture. Only 6% of remnant vegetation remains on private land (MCMA 2008). or endangered. Grassland EVCs have effectively disappeared from the Mallee landscape (ARI 2003). A number of previously well-represented EVCs in the Mallee are now quite heavily cleared and poorly represented in the Mallee parks. These include Woorinen Mallee, Ridged Plains Mallee, Parilla Mallee and Plains Savannah, which are all discussed above. A number of other EVCs are also severely depleted and, in the majority of cases, insufficiently reserved. These are summarised in Table 11. Floristic communities and species have undergone significant changes since settlement. Pine-buloke/ Pine-belah woodlands have been extensively fragmented and their viability is threatened by a severe lack of regeneration of the overstorey species. Four communities found within these woodlands are listed as threatened under the FFG Act and one community is listed under the EPBC Act (See Section 5). The tall shrub layer across most EVCs is severely depleted due largely to grazing of seedlings and saplings. Fifty-five flora species are listed as threatened under the FFG Act and 11 species are threatened nationally. reduced native species diversity. There are, however, some small remnants in good condition with some of the best examples of Buloke woodlands and grasslands occurring on private land in the Mallee (MCMA 2008). These remnants are also extremely important in providing habitat for fauna species, including several threatened species, in an otherwise cleared agricultural landscape. They act as â&#x20AC;&#x2DC;stepping stonesâ&#x20AC;&#x2122; in the landscape and can functionally connect larger remnants for many fauna species. Large old paddock trees also offer nesting and roosting sites in an otherwise cleared landscape (Gibbons and Boak 2002). Careful management of remnants on private land to reduce processes which threaten the diversity of native vegetation and reduce its habitat value for fauna is crucial. A project like the 2008 Buloke Biolink, undertaken with participation from Landcare, saw a coordinated effort to improve the condition of remnant vegetation on private land and along roadsides in order to establish a corridor of buloke woodlands linking the larger remnants of these woodlands. 6.4.3 Remnants on Roadside Corridors A significant amount of remnant vegetation exists on roadside corridors. In the south of the Mallee region, roadside corridors are the major remnant in an otherwise cleared agricultural landscape. Roadside corridors are often the last examples of grasslands here and may provide habitat for threatened species like Chariot Wheels (Maireana cheelii) (MCMA 2008). While the vegetation of several of the five chain roads of the eastern Mallee is in good condition, most roadside vegetation is in poor condition and subject to a number of threats: road maintenance works, weed and rabbit invasion (MCMA 2008). Roadside vegetation also provides vital vegetation corridors linking scattered remnants for many fauna species, including threatened species like the Regent Parrot (Polytelis anthopeplus monarchoides). and a low number of possums and gliders (Phalangeridae and Petauridae) (LCC 1987). The Victorian Mallee has a diverse and unique fauna, with many species associated with the more arid interior having their southernmost distribution in the Mallee. The Mallee also contains a complex mosaic of vegetation communities and habitats: Mallee woodlands and shrublands, heaths, slender cypress-pine, buloke and belah woodlands, riverine forests and woodlands, chenopod shrublands and grasslands, and lakes and wetlands. While some species are restricted to a particular vegetation community, many fauna use a range of different ecosystems, and may feed and nest in separate vegetation communities. Habitat loss and fragmentation, and loss of ecological processes have resulted in a high number of Mallee species being listed or classified as endangered, threatened or vulnerable. The Mallee National Parks (Figure 6) are particularly significant for the conservation of fauna, given the largely cleared and fragmented agricultural landscape in which they occur, and contain a number of species not found elsewhere in the state. The Victorian Mallee contains a very high number of species which are threatened at both a national and a state level. A total of 133 fauna species are on the Advisory List of Victorian Rare or Threatened Species (VROTS), with 44 species being classified as critically endangered or endangered. Six invertebrate and 78 vertebrate fauna species are listed as threatened under the FFG Act, with most of these being birds (47 species) and reptiles (16 species). Seventeen vertebrate species are listed under the EPBC Act, with 11 of these being bird species (Section 5). The Mallee has a particularly rich avifauna with more than 300 bird species having been recorded (LCC 1987). The dominant groups, in both numbers and diversity, are the raptors, parrots and cockatoos, and, in the Big Desert, the honeyeaters. Large old River Red Gums along the Murray River support many hollow-dependent birds, like the Regent Parrot (Polytelis anthopeplus monarchoides). The Pine, Buloke and Belah woodlands support a different suite of hollow-dependent birds such as Major Mitchell’s Cockatoo (Lophocroa leadbeateri). Mallee woodlands and shrublands with porcupine grass understories support Australia’s only megapode, the Malleefowl (Leipoa ocellata). Extensive habitat loss, degradation and fragmentation as well as predation has resulted in a high number of individual Mallee bird species being listed or classified as threatened, vulnerable or endangered. Significantly, the Victorian Mallee Bird Community is listed as threatened under the FFG Act. There is also currently a nomination for the listing of ‘Nationally Threatened Birds of the Murray Darling Basin’ as threatened under the EPBC Act. 7.1.3 Reptiles The number of reptile species in the Mallee exceeds that of any other region in Victoria, with reptiles associated with both semi-arid environments and the moister riverine and creek environments occurring. At least 77 species of reptiles occur: fresh-water tortoises, geckos, legless lizards, dragon lizards, goannas, skinks, blind snakes, venomous snakes and one python, the endangered Inland Carpet Python (Morelia spilota metcalfei). Inland or more northern species such as the endangered Beaked Gecko (Rhynchoedura ornate) and the Coral Snake (Simoselaps australis) reach the southern edge of their distribution (LCC 1987). Eleven frog species occur, including two species listed under the FFG Act: the Growling Grass Frog (Litoria raniformis) and Bibron’s Toadlet (Pseudophryne bibronii). 7.1.4 Fish Nineteen species of native fish have been recorded in the watercourses and lakes of the Mallee region (LCC 1987). Many of these species have declined in range and abundance due to water abstraction and regulation, salination, degradation of habitat and the proliferation of introduced species like European Carp (Cyprinus carpio). Five species are included on the Advisory List VROTS. Two fish species are listed under the EPBC Act as vulnerable: the Murray Cod (Craterocephalus fluviatilis) and the Murray Hardyhead (Maccullochella peelis). 7.2 CURRENT DISTRIBUTION OF FAUNA AND THREATENING PROCESSES The major factors which have impacted on the distribution and abundance of the fauna of the Mallee and account for its high number of threatened species include: •	Habitat loss through historical vegetation clearing •	Habitat fragmentation and loss of connectivity in the landscape •	Habitat degradation and the loss of native flora species and the resources these provide through selective thinning, removal of logs and litter, grazing by stock, rabbits, kangaroos and goats, and weed invasions •	Inappropriate fire regimes •	Changed hydrological regimes •	Predation by foxes and feral cats •	Changed species composition of fauna communities, and the consequent increased competition for limited resources like tree hollows •	Loss of ecological processes. of suitable vegetation. Landscape connectivity includes vegetation corridors linking widely separated remnants or small patches of vegetation and paddock trees which can function as ‘stepping stones’ between habitat patches. Habitat degradation reduces essential foraging, sheltering and nesting sites, and disrupts ecological processes. Grazing changes both the composition and structural complexity of native vegetation (Duncan et al. 2007), and can remove ground and shrub species essential for habitat. The removal of fallen logs and branches removes a range of substrates and microhabitats for grounddwelling and/ or foraging insectivorous birds, reptiles and invertebrates. These species are both important in themselves and are a pivotal component of an ecosystem’s food chains and decomposition cycles. Selective harvesting of large old trees results in a scarcity of tree hollows for hollow-nesting species (LCC 1987). (Ardeotis australis), the Bush Stone-curlew (Burhinus grallarius) and the Apostlebird (Struthidea cinerea) have also been recorded in these woodlands (Sluiter et al.1997). The White-browed Treecreeper (Plate 1) is a specialist of semi-arid woodlands. It particularly favours regenerating Belah or Slender Cypress-pine, or fairly dense thickets of small shrubs. Abundance is highest in intact Belah woodland that is located in a broader landscape of continuous Mallee vegetation. This once common bird is now rare in its distribution and abundance. It is listed as threatened under the FFG Act and is classified as vulnerable in Victoria. This species builds nests in Pine, Buloke and Belah trees in deep hollows and in long limbs or trunks which, on occasion, extend to the ground. Consequently, predation by goannas, cats and foxes are a threat (Hurley and Cheers 2006). The species has a very fragmented distribution. Patches of semi-arid woodland need to be at least 20 ha in area to sustain a population (Hurley and Cheers 2006). In addition, in agricultural landscapes patches of suitable habitat which are more than 3 km from an existing population are unlikely to support populations. A survey undertaken in 2006 found that there had been a substantial decline in the population of the White-browed Treecreeper, with a 25% reduction in the number of semi-arid woodland patches where the species was present (Hurley and Cheers 2006). River and watercourses of the Mallee provide important habitat for many hollow-dependent birds such as parrots, cockatoos, kingfishers, tree creepers and bats. The smaller hollows of the Black Box provide nesting and roosting sites for bats, possums and gliders, and birds such as nightjars, kingfishers and pardalotes (LCC 1987). The endangered Inland Carpet Python lays its eggs in hollow logs in these woodlands and shelters during the day in hollows in trees or under thick litter or shrubs. Raptors, like the endangered White-bellied Sea-eagle (Haliaeetus leucogaster), feed and nest in the River Red Gums. The grey, cracking clays of the floodplain are used as habitat by a number of reptiles and snakes, including the vulnerable Bandy Bandy (Vermicella annulata). The small, carnivorous marsupial, Giles Planigale, listed as threatened under the FFG Act and classified as near threatened in Victoria, shelters and forages for invertebrates and small vertebrates in the grey, cracking clays of lignum shrublands. Clearing, loss of mature trees, removal of logs and litter, changed flooding regimes and consequent soil dessication and altered wetting and drying patterns of wetlands, salinisation and the death of overstorey species, grazing by cattle and rabbits, soil compaction, weed invasion and predation by foxes and cats have all impacted on the biodiversity of these riverine ecosystems. Many grazed Black Box woodlands now have a depauperate understorey, high in grazing resistant native species and weeds. Threatened and near-threatened species found in this riverine environments include the White-bellied Sea-eagle, the Regent Parrot, the Bush Stone-curlew, the Barking Owl (Ninox connivens), the Nankeen Kestrel (Falco cenchroides), the Great Egret (Ardea alba), the Pied Cormorant (Phalacrocorax varius), the Royal Spoonbill (Platalea regia), the Bandy Bandy, the Inland Carpet Python, the Bardick (Echiopsis curta), Giles Planigale and the Growling Grass Frog. The Regent Parrot (Plate 2) is listed as nationally vulnerable under the EPBC Act and classified as vulnerable in Victoria. It nests in hollows in River Red Gum forests along the Murray River and Outlet Creek during the breeding season but feeds primarily in large blocks of intact Mallee woodlands within 20 km of their breeding sites (Baker-Gabb and Hurley 2010). Scarcity of large old Red Gums due to selective tree harvesting, and tree health decline and death is one threat. The major threat, however, is the changed vegetation mosaic of the Mallee landscape and the fragmentation of the speciesâ&#x20AC;&#x2122; habitat. Much of the Mallee woodlands in proximity to the riverine forests has been cleared for agriculture, and Regent Parrots will not nest in Red Gum forests where there are not Mallee woodlands within 20 km (Baker-Gabb and Hurley 2010). In this fragmented landscape, the Regent Parrot needs woodland corridors (which act as protection from raptors) to link its nesting and foraging sites. Ongoing clearing of these corridors further threatens the viability of this species. The Mallee National Parks (Figure 6, page 19) contain extensive areas of dunefield vegetation where Triodia (porcupine grass) is either the dominant species of the understorey or a significant component (Woorinen Sands Mallee, Loamy Sands Mallee, Lowan Mallee, Heathy Mallee and Heathland). Triodia provides a variety of microhabitats for fauna as hummocks grow, expand and senesce. Several threatened mammal, bird and reptile species are present in these vegetation communities. These include the endangered Mallee Emu-wren (Stipituris mallee), the Striated Grasswren (Amytornis striatus), the Millewa Skink (Hemiergis millewae), the Mallee Ningaui and the Malleefowl. Older age-classes of vegetation (e.g. 20 â&#x20AC;&#x201C; 50 years post-fire) are particularly important for many of these species (Brown et al. 2009; Robertson et al. 2011). The extent of key vegetation types of appropriate fire age-class holds the key to these speciesâ&#x20AC;&#x2122; distribution and conservation (ARI 1989, Kelly et al. 2012). The Millewa Skink is listed as threatened under the FFG Act and is classified as critically endangered in Victoria. This habitat specialist has an extremely restricted distribution in the Murray-Sunset National Park. Its habitat is long-unburnt stands of Mallee with large Triodia hummocks in the understorey. Large, old hummocks with significant amounts of litter and other dead material provide a suitable microhabitat and food supply of invertebrates for this species. Habitat conditions may not develop for in excess of 30 years after fire (Robertson et al. 2011). As this species has low mobility and a low potential rate of population increase, fire poses a significant threat to the small populations of this species. The Mallee Ningaui is classified as vulnerable in Victoria and is a small, nocturnal marsupial which is found predominantly in the Murray-Sunset and Big Desert National Parks. It is insectivorous and forages in the litter for its prey. There is a marked decline in population numbers after fire and the consequent reduction of cover of Triodia and litter (Kelly et al. 2010). Optimal breeding of the species has been found to occur in patches of vegetation which have not been burnt for at least 40 years (Kelly et al. 2010). The once common Malleefowl is now listed as vulnerable under the EPBC Act and classified as endangered in Victoria. Too frequent fire is considered one of the four main threatening processes for this species, with the others being predation by foxes, effects of habitat fragmentation, and habitat degradation due to overgrazing by sheep and feral goats. Large-scale fire can reduce breeding for several decades. A 2006 survey found that Malleefowl numbers had been negatively affected by past fires; sites that had been burnt since the 1970s had lower breeding counts than unburnt sites (Benshemesh et al. 2006). Malleefowl are usually slow to return after fire and usually will not breed in areas that have been burnt within the previous 10 years (Benshemesh 1990). (The 2006 survey found, however, two sites where breeding had begun within 6 to 8 years post-fire.) Malleefowl do not reach maximum breeding capacity at sites until at least 40 years post-fire (Benshemesh 1990). The Lowan Sand dunefields of the Big Desert have extensive areas of heathy vegetation. Time since fire is a major determinant of the floristics and structural complexity of these communities and the distribution of fauna species. Heathland and heathy Mallee reach their greatest plant species diversity in the first five years after fire. This early stage of post-fire vegetation provides optimal habitat for the vulnerable Silky Mouse, as a major part of its diet is seeds (LCC 1987). The Mallee Worm-lizard (Aprasia aurita) (Plate 3) is an extremely rare, endemic species with a very restricted distribution and is listed as threatened under the FFG Act. It is known from four populations: one centred on Wathe Flora and Fauna Reserve; one on the eastern and south-eastern parts of Wyperfeld National Park; one on Paradise Flora and Fauna Reserve and the other on the northern fringe of the Big Desert south of Murrayville (Robertson et al. 2009). Its diet consists mainly of larvae or pupae of species of small (< 3 mm) ants. Many aspects of this speciesâ&#x20AC;&#x2122; ecology are unknown and its distribution may be dependent on particular ecological interactions, such as with species of small ants (Robertson et al. 2009). It had been thought to occur only in long unburnt Mallee and heathy vegetation (LCC 1987) but has since been found to occur in recently burnt vegetation. However, population densities are highest in long unburnt vegetation, and the effects of fire on this species, and its prey, are unclear (Robertson et al. 2009). 7.6 ACTION STATEMENTS FOR LISTED SPECIES AND MALLEE CMA BIODIVERSITY FACT SHEETS Action statements have been prepared for a number of threatened species in the Mallee which are listed under the FFG Act. Action Statements are management plans for species listed under the FFG Act. They contain information on the ecology of the species, threats and management actions to reduce these threats. Action Statements are available from the DSE websites. Fact sheets summarizing habitat, distribution and threats to endangered species, including the endangered Black-eared Miner (Manorina melanotis) and Inland Carpet Python, are available on the Mallee CMA website. Threatening processes are processes that threaten the abundance and survival of native flora and fauna, and the ecological communities of which they are a part. Threatening processes can result in a severe decline in biodiversity and the resilience of natural assets, such as soil, and lead to a loss of ecological function. While these threatening processes are discussed separately below, many of them interrelate and interact together. Threatening processes are listed under the FFG and EPBC Acts. 8.3 LANDSCAPE AND HABITAT FRAGMENTATION The extensive clearing of the Mallee vegetation for agricultural production has resulted in a mosaic of scattered, often small and isolated patches of remnant vegetation dispersed across the landscape. This process, whereby large continuous patches of vegetation are broken up into a number of smaller, scattered patches, is termed landscape fragmentation. While much of the pattern of the Mallee landscape was set many decades ago, there has been ongoing loss of small vegetation patches and paddock trees, which continues to fragment further the Mallee landscape (ARI 2005). Fragmentation is the most extreme in the southern Mallee where scattered old paddock trees, often in poor health, and (often degraded) roadside corridor vegetation remain the only vegetation for several kilometres (MCMA 2008). In the large, agricultural regions of the Mallee, fragmentation has severely diminished the ‘connectivity’ of the landscape, thereby breaking the linkages of habitats, species communities and ecological processes. It, in combination with general vegetation loss, has resulted in large declines in biodiversity, losses of ecological processes (like pollination, breeding and regeneration) and decline in ecological function, and therefore decreased the resilience of ecological communities, ecosystems, and landscapes. Remnant patches of vegetation are particularly susceptible to surrounding land-use and often have high levels of nutrients and soil. They have a high proportion of disturbed ‘edge vegetation’ (Saunders et al.1991), which typically has high levels of weed invasion and, consequently, lower numbers and cover of native species. Fragmentation can alter important reproductive functions of flora species by changing the plant’s physical environment and its interactions with fauna. Vegetation fragmentation both decreases the habitat value of individual remnant patches for many fauna species and reduces the ability of many fauna species to move through the land, the landscape’s ‘functional’ connectivity. The level of connectivity varies between species due to their dispersal capabilities and landscape configuration requirements. Habitat fragmentation is a factor in the decline of many now threatened species in the Mallee (Section 7). Maintaining and re-establishing landscape and habitat connectivity is a priority for these threatened fauna species. 8.4 INTRODUCED PEST PLANT SPECIES Invasive pest plant species impact on both agricultural land and native vegetation. For the most part, soil and vegetation disturbance create the conditions that allow environmental terrestrial weed species to establish and spread. For aquatic weeds, eutrophication (increased nutrient levels in waterways) is an important factor in producing the conditions that allow these species to establish and spread. Environmental weeds can outcompete native species for space, light and soil resources, like nutrients and water, and impede their regeneration. They reduce the diversity of native species within a vegetation community, changing its composition and structure. They can also change pollinator relations within an ecological community, the fauna species which use vegetation patches, and provide habitat for introduced fauna species (MCMA 2008). Agents of dispersal can include wind, birds, vehicles and equipment, and stock. Highly invasive environmental weeds in the Mallee include bridal creeper (Asparagus asparoides), African Boxthorn (Lycium ferocissimum), Horehound (Marrubium vulgare) and Cactus species, (Opuntia spp.) (MCMA 2011). (Weeds like African boxthorn and horehound also reduce productivity on agricultural land (MCMA 2008)). With the increased planting of olives and almonds, these species are beginning to establish in remnant vegetation on private and public land (MCMA 2008). Athel Pine (Tamarix aphylla) is a Weed of National significance (WoNS) and is extremely invasive. No understorey plants, shrubs or herbs will grow under this species because of the build-up of salty, dropped leaves. It can outcompete River Red Gums and small native shrubs. This weed has limited distribution in the Mallee at present, and coordinated action has been undertaken to remove it and stop its spread (MCMA 2010). Much valuable roadside vegetation has been invaded by weeds. Boxthorn has infested roadside vegetation. Boxthorn also provides harbour for rabbits and foxes, doubling its impact. Bridal creeper spreads quickly along roadsides and riparian vegetation. Ward’s Weed (Carrichtera annua) has spread widely along roadsides and public land in Millewa, even in the absence of disturbance (MCMA 2008). The understories of many vegetation communities have been invaded by introduced grasses and are now often dominated by species such as Barley Grass (Hordeum vulgare), Bromes (Bromus spp. ), Fescues (Vulpia spp.) and Wild Oats (Avena fatua) (ARI 2003). Turnip species (Brassica spp.) and Onion Weed (Asphodelus fistulosus) can quickly take over the groundlayer of remnant vegetation and are difficult to eradicate. The Mallee CMA has produced a number of Fact Sheets on weed species which are available from its website. The IPA Strategy (2011) provides the basis for the management of invasive plant species at a regional level. It also contains lists of invasive plant species declared as noxious weeds under the CaLP Act and the Fisheries Act (Section 5.3.3). It is available from the Mallee CMA website. 8.5 PREDATION BY INTRODUCED SPECIES The major predators of the Mallee are foxes and feral cats. Predation by foxes is believed to be a major factor in the extinction of at least six mammal species in the Mallee and is an ongoing threat to several threatened species (MCMA 2011). While the main prey of the fox is the rabbit, fox predation is a significant threat to native fauna, particularly ground-feeding and ground-nesting species. Foxes have been found to prey on a wide range of native fauna: possums, small mammals, birds, amphibians and reptiles (LCC 1987), including the endangered inland carpet python. Foxes are a major predator of ground-dwelling birds at Pink Lakes (MCMA 2011). The importance of fox control increases when rabbit control works are undertaken as foxes are thought to switch from their main prey species to native species (MCMA 2011). Feral cats also prey on native mammals, large ground-feeding birds, such as galahs and parrots, and a wide range of reptiles. Cats (and foxes) also shelter in fallen timber and clumps of vegetation that are important habitat for a number of ground-dwelling birds, small mammals and reptiles (LCC 1987). Wild dogs are confined to the proximity of public/private land boundaries around the major blocks of public land, particularly around the southern edge of the Big Desert. Their impact on native species is not well understood (MCMA 2011). The IPA Strategy (2011) provides the basis for the regional control of foxes and wild dogs. highly variable natural flows, with large areas drying to a series of isolated pools (MCMA 2006). 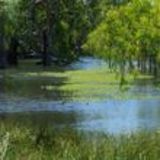 Changes to the flooding regime (its seasonality, frequency, magnitude and duration) have reduced the biodiversity of, and disrupted ecosystem function in, many riverine and wetland ecological communities. Riverine ecological communities are adapted to seasonal flow variability, periodic flooding and, in the case of wetlands, cycles of wetting and drying. Altered flooding regimes have disrupted natural wetting and drying cycles, and resulted in the decline and local extinction of several wetland-obligate flora species (ARI 2003) and reduced breeding in many wetland bird species (MCMA 2006). Reduced flooding has seen the decline and lack of regeneration of many riverine flora species, including River Red Gum which provides vital habitat for many hollow-dependent fauna species. It has resulted in shifts in the plant species composition of riverine vegetation communities. Many species associated with drier soil conditions have colonized these communities, while other species associated with riverine vegetation communities, like lignum, have been unable to persist (ARI 2003). Lack of flushing of increasingly saline soils has seen many floodplain flora communities invaded by salt-tolerant semi-succulents (ARI 2003). Lack of flooding has seriously impacted on the ecological functioning of the Murray River and its associated floodplain ecosystems, the hydrology of floodplain environments like Lindsay and Walpolla Islands, the Hattah Lakes and its associated bird and amphibian communities, and the ecosystems of the Lalbert, Tyrrell, Dunmunkle, Outlet and Yarriambiack Creeks (MCMA 2006). The fire regime (its frequency, intensity, seasonality and extent) determines the composition, structure and boundaries of vegetation communities in the highly flammable Mallee woodlands, shrublands and heathlands, and shapes the mosaic of differently aged, post-fire vegetation communities across the Mallee landscape (Parsons 1994, Bradstock and Cohn 2002). Different fauna species require differently aged vegetation to meet shelter, food and breeding requirements and the management of fire for ecological purposes is complex (Section 7). Additionally, the ideal fire regime for many species is unknown. The key to the conservation of any particular fauna species is the maintenance of vegetation of a fire-age class suitable for its habitat needs (Kelly et al. 2012). Too frequent fire is a major threat to several threatened fauna species which use vegetation communities with Triodia understories, where older age classes (20 to 50 years post-fire) are their preferred habitat (Robertson et al. 2011; Benshemesh 1990 and Brown et al. 2009). Too frequent fire also prevents hollow formation, a vital resource for hollow-dependent species, as hollows do not develop in live tree stems of Mallee eucalypts before 40 years post-fire (Haslem et al. 2011). Wildfire in the Mallee also often occurs on a large scale; this is a particular threat to small and isolated populations of fauna which can be destroyed if there is no opportunity for recolonisation (Benshemesh 2006). However, periodic fire is required to maintain the diversity of the shrub and groundlayers of many vegetation communities, and, in the long-term absence of fire, there is little regeneration of several woody understorey species (LCC 1987). Many remnants on private land have not been purposely burnt since settlement (MCMA 2008). In the dunefields of the northern Mallee, most remnant vegetation on private land and on roadsides consists of old or mature vegetation communities. The absence of fire may be impeding the regeneration of the understorey of these remnants (MCMA 2008). soil salinity levels. This vegetation community has expanded significantly since settlement, replacing salt paperbark woodlands and some Mallee communities in several low-lying areas (ARI 2003). Increased salinity has been a major contributor to River Red Gum and Black Box decline, particularly in the far north- west corner. Increased salinity has also seen major shifts in the species composition of many chenopod (saltbush) shrublands, where semi-succulent species adapted to sub-saline and saline soils have displaced saltbush and bluebush species (ARI 2003). 8.9 CLIMATE CHANGE Climate change has been identified as a critical issue facing the Mallee: it is projected that the region will be hotter and drier than it is today. Anticipated effects on the region include: increased temperature, with an increase in the number of days over 35oC; decreased annual and seasonal total rainfall, with intensity of heavy daily rainfall expected to rise in some seasons and decrease in others; lower soil moisture and increased extreme weather events like fire and drought (DSE 2008). 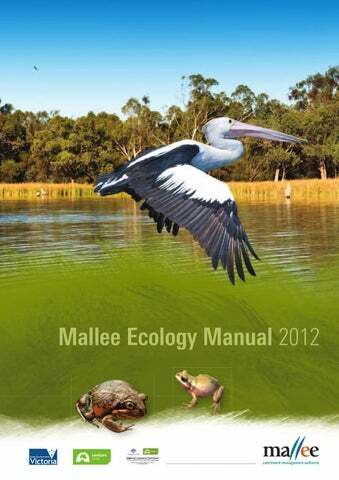 (The DSE (2008) has produced a brochure Climate change in the Mallee which contains a summary of how the climate is expected to change based on a range of greenhouse gas emissions scenarios. This brochure can be accessed at: www.climatechange.vic.gov.au/_ data/assets/pdf_file/0012/73200/Mallee_Web.pdf ) While there is uncertainty as to how individual species and ecosystems will react to the combined impacts of this scenario, changed climate conditions are likely to have significant negative impacts on the biodiversity of the Mallee. Changed climate conditions are likely to exacerbate the negative impacts of existing threats, like habitat loss and fragmentation, invasive species and broadscale wildfires (DSE 2008). Species with restricted or specialised habitat requirements, poor dispersal abilities and/or small populations are likely to be most at risk from climate change. Climate change is likely to influence the composition of ecosystems and their distribution by altering water flows in rivers and wetlands, and affecting the flood and fire regimes (DSE 2008). Ecological processes are the physical, chemical and biological processes that link organisms and their environment and sustain a functioning ecosystem. They include natural disturbance regimes (fires, flood), nutrient cycling, biotic interactions like pollination, and population maintenance processes such as reproduction, regeneration, dispersal, migration and predation. A diverse and changing set of living organisms within a community, interacting with each other and with the physical elements of the environment in which they are found. Ecosystems are identified at various scales. Ecosystem function depends on ecological processes and the ongoing maintenance and replenishment of the elements of a given ecosystem. Basic ecosystem functions include soil formation and stabilisation, nutrient cycling and water recycling. Disruption to ecological processes results in a loss of function. Typical indicators of a loss of function are invasion by weed species, soil erosion, loss of nutrient cycling, disrupted breeding cycles and failure to regenerate, species population imbalances and general loss of biodiversity. Cover of native vegetation is central to ecosystem function at a catchment scale. Ecosystem resilience is the capacity of an ecosystem to experience shocks while essentially retaining the same functions, processes and structure. The more resilient an ecosystem, the larger the disturbance it can absorb without shifting to an alternative state. The concepts of ecosystem function and ecosystem resilience are closely related. An ecosystem or landscape with high ecosystem function is likely to be more resistant to present and future disturbance. The concept of resilience can also be used to characterise landscapes, habitats and communities. A landscape approach to conservation emphasizes that all components of the landscape are important, not just single (usually rare or threatened) species. A landscape-scale of planning and implementation incorporates areas much larger than individual sites, properties or habitats, and often includes a mix of different vegetation types and landforms. Landscape fragmentation is the process whereby large continuous areas of native vegetation are broken up into smaller, often isolated patches. Landscape connectivity is the degree to which the landscape helps or hinders movement of species among habitat patches. Landscape connectivity includes the linkages of habitats, species communities and ecological processes at multiple scales. Structural connectivity describes only physical relationships among habitat patches such as habitat corridors or inter-patch distance. Functional connectivity focuses on the degree of movement or flow through the landscape. Landscape fragmentation reduces connectivity for most species. Life forms are a system for categorising plants that emphasise plant function in the ecosystem. Life form is very similar to growth form and looks at the overall form and structure of a plant. Life forms include large shrub, medium shrub, small shrub, large herb, hummock grass and so on. Spatially explicit biophysical components of the environment that provide ecosystem goods and services to the community eg. soils, native vegetation. Stepping stones are dispersed patches of vegetation (such as scattered trees in a paddock) which may not be directly connected to one another but still provide important connectivity for mobile species such as birds, bats and butterflies. Weeds of National Significance (WoNS) are 20 weed species which have been agreed upon by the Australian and state governments as priority species for sustained nationally coordinated action under the Australian Weeds Strategy. References ARI (2003) The Vegetation of North-West Victoria. A Report to the Wimmera, North Central and Mallee Catchment Management Authorities. Arthur Rylah Institute for Environmental Research, Heidelberg, Victoria. ARI (2005) Understanding and improving ecosystem function in the Murray Mallee and Wimmera bioregions. Unpublished report for Project Year 1 (2005) to the North Central and Mallee Catchment Management Authorities. Arthur Rylah Institute for Environmental Research, Heidelberg, Victoria. Baker-Gabb, D. and Hurley, V. (2010) National Recovery Plan for the Regent Parrot (eastern species) Polytelis anthopeplus monarchoides (Draft Version). Department of Sustainability and Environment, Melbourne. Bennett, A., Clarke, M., Avitable, S., Brown, L., Callister, K., Haslem, A., Kelly, L., Kenny, S., Nimmo, D., Spence-Bailey, L., Taylor, R., Watson, S. and Holland, G. (2010) Fire and Wildlife in the Mallee. Insights for conservation and management. www. latrobe.edu.au/zoology/research/mallee-fire/index.html, accessed 18 May 2012. Benshemesh, J. (1990) Management of Malleefowl with regard to fire. In The mallee lands: a conservation perspective. (Eds.J.C. Noble, P.J. Joss, and G.K. Jones) pp. 206 – 211 CSIRO Publications: Melbourne. Benshemesh, J., Barker, R. and MacFarlance, R. ( 2006) Trend analysis of Malleefowl monitoring data 2006. Unpublished report to the Mallee Catchment Management Authority, Victorian Malleefowl Recovery Group (VMRG) and multiregional “National Malleefowl Monitoring, Population Assessment and Conservation Action Project” steering committee. Bowler, J.M. (1982) Aridity in the late Tertiary and Quaternary of Australia. In Evolution of the flora and fauna of Australia. (Eds. W.R.Barker and J.M.Greenslade) pp.35 – 44 Peacock Publications: Adelaide. Bowler, J.M. and Magee, J.W. (1978) Geomorphology of the Mallee region in semi-arid northern Victoria and western New South Wales. Proceedings Royal Society of Victoria. 90: 35-44. Bradstock, R.A. and Cohn, J.S. (2002) Fire regimes and biodiversity in semi-arid mallee ecosystems. In Flammable Australia: the fire regimes and biodiversity of a continent. (Eds. R.A. Bradstock, J.E. Williams and A.M. Gill) pp. 238 - 258 Cambridge University Press: Cambridge. Brown, S., Clarke, M. and Clarke, R. (2009) Fire is a key element in the landscape-scale habitat requirements and global population status of a threatened bird: the Mallee Emu-wren (Stipiturus mallee). Biological Conservation 188 (2): 395 – 410. Cheal,D.C. and Parkes, D.M. (1989) Mallee Vegetation in Victoria. In Mediterranean Landscapes in Australia (Eds. J.C. Noble and R.A. Bradstock) CSIRO Publications: Melbourne. Clarke, M.F., Avitabile, S.C., Brown, L., Callister, K.E., Haslem, A., Holland, G.J., Kelly, L.T., Kenny, S.A., Nimmo, D.G., Spence-Bailey, L.M., Taylor, R.S., Watson, S.J. and Bennett, A.F. (2010) Ageing mallee eucalypt vegetation after fire: insights for successional trajectories in semi-arid mallee ecosystems. Australian Journal of Botany 58: 363 – 372. DPI (2009) Mapping the Mallee’s Saline Land – Stage 3: Classifying Mapped Salinity. Unpublished report to the Mallee Catchment Management Authority. DPI (Victoria) Victorian Resources Online www.vro.dpi.vic.gov. au/malregn.nsf/pages/mallee_soil_index , accessed February 2012. DSE (1997) Victoria’s Biodiversity Strategy. Department of Sustainability and Environment, Melbourne. DSE (2004) Vegetation Quality Assessment Manual - Guidelines for applying the Habitat Hectares Scoring Method. Version 1.3. Department of Sustainability and Environment, East Melbourne. DSE (2008) Climate change in the Mallee. www.climatechange.vic.gov.au/_data/assets/pdf_ file/0012/73200/Mallee_Web.pdf , accessed , 21 May 2012 DSE (2007) EVC Bioregion Benchmarks for Vegetation Quality Assessment. Department of Sustainability and Environment website (www.dse.vic.gov.au) DSE (Victoria) Native vegetation information. Information sheet No.2. Department of Sustainability and Environment, Melbourne. DSE (Victoria) Native vegetation information. Information sheet No.5. Department of Sustainability and Environment, Melbourne. Duncan,D., Moxham, C. and Read, C. (2007) Effect of stock removal on woodlands in the Murray Mallee and Wimmera bioregions of Victoria. Prepared on behalf of the Mallee and North Central Catchment Management Authorities by Arthur Rylah Institute for Environmental Research and the School of Botany, Melbourne. Gibbons, P. and Boak, M. (2002) The value of paddock trees for regional conservation in an agricultural landscape. Ecological Management & Restoration 3 (3): 205 - 210. Gibbons, F. and Rowan, J. (1993) Soils in relation to vegetation in Victoria. In Flora of Victoria- Volume 1 (Eds.D.B.Foreman & N.G.Walsh) pp. 154 -194 Inkata Press: Melbourne. Haslem, A., Kelly, L.T., Nimmo, D.G., Watson, S.J., Kenny, S.A., Taylor, R.S., Avitabile, S.C., Callister, K.E., Spence-Bailey, L.M., Clarke, M.F. and Bennett, A.F. (2011) Habitat or fuel? Implications of long-term, post-fire dynamics for the development of key resources for fauna and fire. Journal of Applied Ecology 48: 247 – 256. References Cont’d... Hopley, J. and Clark, R. (2010) Disaggregation of the Victorian Mallee land systems into landform components. Final Project Report for the Mallee CMA. . Future Farming Systems Research, Department of Primary Industries, Bendigo. Platt, S.J. and Lowe, K.W. (2002) Biodiversity Action Planning: action planning for native biodiversity at multiple scales – catchment, bioregional, landscape, local. Department of Natural Resources and Environment, Melbourne. Hopley, J., Clark, R. and MacEwan, R. (2011) Assigning wind erosion susceptibility to Mallee landforms and land units. Final Project Report for the Mallee CMA. Future Farming Systems Research, Department of Primary Industries, Bendigo. Rees, D.B. (2000) Land Systems of Victoria. Edition 3. Technical Report No. 56. Centre for Land Protection Research, Bendigo. Hurley, V. and Cheers, G. (2006) Survey of White-browed Treecreepers in the Victorian Mallee. Report to the Mallee CMA, Mildura. Kelly, T.K., Nimmo, D.G., Spence-Bailey, L.M., Clarke, M.F. and Bennett, A.F. (2010) The short-term responses of small mammals to wildfire in semi-arid mallee shrubland, Australia. Wildlife Research 37: 293 – 300. Kelly, L.T., Nimmo, D.G., Spence-Bailey, L.M., Taylor, R.S., Watson, S.J., Clarke, M.F. and Bennett, A.F. (2012) Managing fire mosaics for small mammal conservation: a landscape perspective perspective. Journal of Applied Ecology 49 (2): 412 – 421. Robertson, P., Coventry, P. and Sluiter, I. (2011) Survey for the threatened Millewa Skink (Hemiergus millewae) in Murray-Sunset National Park, April 201l. Unpublished report to the Mallee Catchment Management Authority. Wildlife Profiles Pty. Ltd., Melbourne. Robertson, P., Ahern, L., Gibbons, D. and Sluiter, I. (2009) Survey of Wathe Flora and Fauna Reserve and eastern Wyperfeld National Park for the Mallee Worm Lizard (Aprasia aurita) October 2008. Unpublished report to the Mallee Catchment Management Authority. Wildlife Profiles Pty. Ltd., Melbourne. Rowan, J.N. and Downes, R.G. (1963) A Study of the Land in North-Western Victoria. Soil Conservation Authority, Technical Communication No.2, Victoria. LCC (1987) Mallee Area Review. Land Conservation Council, Melbourne. Sandell, P. (2009) Mallee Woodlands Bouncing Back – Protecting our semi-arid woodlands from rabbits. Under Control Pest Animal and Management News. 39 p.5. Lorimer, M.S. (1985) Estimating the susceptibility of soil to wind erosion in Victoria. Journal of Australian Institute for Agricultural Science 51 (2):122-127. Sandell, P., Tolhurst, K., Dalton, J., Scott, B. and Smith, M. (2006) Fire management prescriptions for the Victorian mallee parks. Proceedings of the Royal Society of Victoria 188 (2): 1610 – 1619. Mallee CMA (2006) Mallee River Health Strategy. Mallee Catchment Management authority, Mildura. Saunders, D.A., Hobbs, R.J., Margules,C.R. (1991) Biological Consequences of Ecosystem Fragmentation: A Review. Conservation Biology 5 (1): 18 - 28. Mallee CMA. (2008) Mallee Native Vegetation Plan. Mallee Catchment Management Authority, Mildura. Mallee CMA (2010) Athel Pine Tamarix aphylla Fact Sheet. Mallee Catchment Management Authority, Mildura. Mallee CMA (2011) Mallee Invasive Plants and Animals Management Strategy. Mallee Catchment Management Authority, Mildura. Mallee CMA (n.d.) Salinity Investigation and Management in the Mallee Dryland area. Technical Note Number: MO2 Parks Victoria (2002) Vegetation Recovery in the Victorian Mallee Parks 1991 – 1998. Conservation Environmental Management Occasional Paper Series, Melbourne. Parr, C.L. and Anderson, A.N. (2006) Patch mosaic burning for biodiversity conservation: a critique of the pyrodiversity paradigm. Conservation Biology 20: 1610 – 1619. Parsons, R.F. (1994) Eucalyptus Scrubs and Shrublands. In Australian Vegetation ((Ed. R.H. Groves) pp. 291 -319. Cambridge University Press: Cambridge. Sluiter, I.R.K., Minchin, P.R. and Jaensch, S.C. (1997) The Buloke and Pine Woodlands of semi-arid and dry sub-humid Victoria and nearby areas. Unpublished report by the Victorian Department of Natural Resources and Environment. Watson, S.J., Taylor, R.S., Nimmo, D.G., Kelly, L.T., Haslem, A., Clarke, M.F. and Bennett, A.F. (2012) Effects of time since fire on birds: How informative are generalized fire response curves for conservation management? Ecological Applications 22 (2): 685 – 696.